Gas-to-coal switching led to a 0.2 bcm (29%) y/y drop in power sector gas burn in Spain through September, despite warmer weather. This is a trend that we see continuing through this winter as the premium Northeast Asian markets will steer cargoes away from Southern Europe, which will keep PVB and PSV gas prices high. From our previous forecast of a 1.0 bcm drop y/y, we now expect total Spanish gas demand to be 1.4 bcm lower y/y this winter, assuming weaker non-power sector gas demand on mean-reverting temperatures. Our forecasts for Italian gas demand remain unchanged from last month, 3.5 bcm down y/y, due to lower heating gas demand and less gas available for the power sector. LNG port receipts and sendout shrank in both countries as the JKM’s premium incentivised cargoes to go to Asia, and it will not be until late Q1 18 onwards that we expect additional LNG supply to arrive into Europe. Higher North African flows helped both countries balance, while Italian imports of European gas through TENP and Tarvisio were also higher y/y. The heatwave that gripped the Southern European markets of Spain and Italy during August continued through September, prompting higher power demand for cooling needs. CDDs in Spain were as much as 50% higher y/y and 29% over the five-year average, driving a 0.8 TWh (4%) y/y increase in total power generation. Although most of the incremental demand was met with hydro generation, gas-to-coal switching occurred again, cutting gas-fired output by 1.1 TWh (33%) y/y and driving a 0.2 bcm (29%) y/y decline in power sector gas burn. Behind the fuel switch, the flat price PVB M+1 has seen significant gains through the year and was higher by 5.5 €/MWh (24%) y/y at 28.9 €/MWh as of 9 October, discouraging power sector gas burn. Despite that big rise, even larger increases in NW European gas prices have helped narrow the PVB premium to the TTF, with the M+1 spread now at 1.4 €/MWh from 4.1 €/MWh a year earlier. 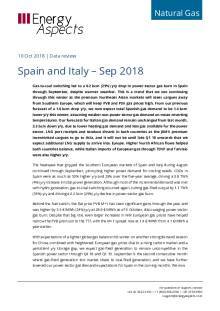 With expectations of a tighter global gas balance this winter on another strong demand season for China, combined with heightened European gas prices due to a rising carbon market and a persistent y/y storage gap, we expect gas-fired generation to remain uncompetitive in the Spanish power sector through Q4 18 and Q1 19. September is the second consecutive month where gas-fired generation lost market share to coal-fired generation, and we have further lowered our power sector gas demand expectations for Spain in the coming months. We now expect power sector gas burn to be 0.4 bcm lower y/y through winter from a milder 0.04 bcm y/y drop in our previous forecast. Total Spanish gas demand will drop by 1.4 bcm y/y during the period to 16.5 bcm, assuming a reversion to normal temperatures after a very cold Q1 18. Further increases in wind or hydro generation—reservoir levels stood 50% higher y/y and mostly in line with the 10-year average as of 9 October—would also crowd out thermal from the generation mix. Italian gas demand forecasts for this winter remain unchanged from last month, with total consumption shrinking by 3.5 bcm y/y to 46.1 bcm, driven by a 2.1 bcm drop in residential gas demand (assuming a reversion to normal weather). CDDs in September were at their highest since 2011 and, as in Spain, prompted an increase in power demand for cooling. Thermal output increased by 2.8 TWh (22%) y/y, with wind generation down and hydro generation largely unchanged. Power sector gas demand stepped up by 0.4 bcm (19%) y/y, although we do not expect the trend to continue through the winter. With hydro reservoir levels going into the winter 7% higher y/y, mean-reverting temperatures promising lower demand, and forecast rising global gas prices through the winter pushing gas out of the generation mix, we expect power sector gas demand to slow in Italy by 0.22 bcm y/y. In September, the premium Northeast Asian markets continued to steer cargoes away from Europe, with port receipts in Spain and Italy reduced by a combined 0.42 bcm y/y. Spanish sendout into the system was the lowest since September 2016, at 0.9 bcm (-0.4 bcm y/y), while LNG flows in Italy stepped down, by 0.31 bcm y/y to 0.6 bcm. As we have argued in the last few months, we expect that trend to continue through this winter as strong Chinese demand drives JKM prices higher and attracts cargoes away from the European markets. It is not until late Q1 19 that we expect to see more LNG volumes finally arriving in Europe, with the start-up of new liquefaction capacity. Additional North African supply will help the Spanish market meet demand through the winter. Algerian imports into Spain year-to-date are up by a hefty 2.7 bcm (28%) y/y, expanding by 0.2 bcm (21%) from last year in September. Italian gas takes from North Africa also increased, by 0.16 bcm y/y to 1.5 bcm last month. Through Q4 18 and Q1 19 we expect North African flows into both countries to rise by a combined 0.8 bcm y/y, to 24.3 bcm, to help make up for reduced LNG flows. Italian imports of European gas expanded by 0.62 bcm (24%) y/y in September, driven by a 0.4 bcm increase in flows through TENP via Switzerland. 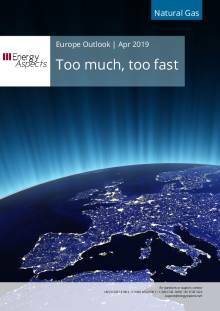 Imports of Russian gas through Austria stood 0.2 bcm higher y/y. Flows through Tarvisio from TAG into the Italian system slowed down significantly on planned maintenance, which limited flows by 55% from 25 September to 8 October. We expect Russian supplies into Europe to increase this winter, although flows into Italy could be limited due to a hefty 2.1 bcm y/y storage gap in the Baumgarten region. In contrast, Italian gas in storage stood 0.4 bcm higher y/y as of 1 October, helping moderate the country’s need for additional Russian gas.